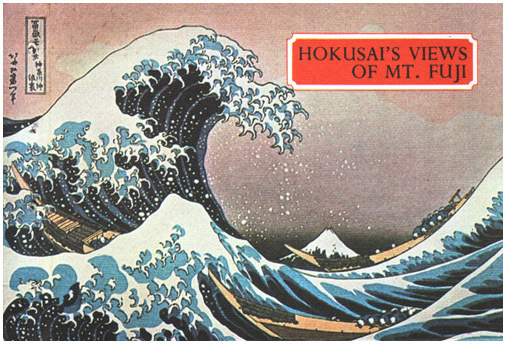 "HOKUSAI'S VIEWS OF MT. 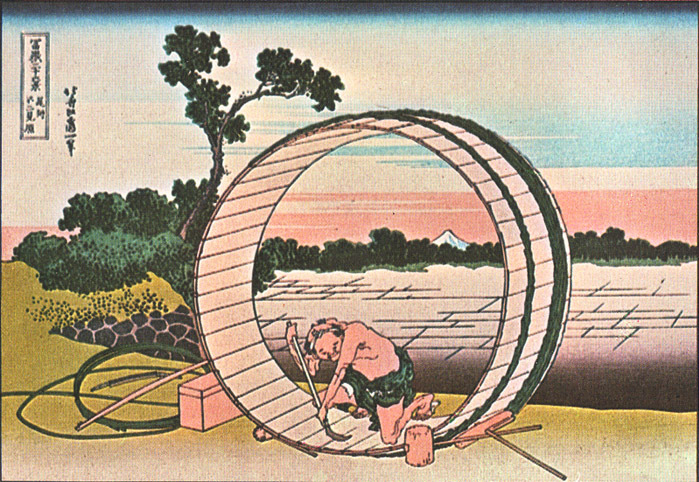 FUJI"
Ar sixty-three, the artist Hokusai paused. What a career to look back upon! Mad about drawing since the age of six, he had found the training he needed to develop his talent. In early boyhood he had been apprenticed to a wood engraver m his home city, Edo (the present-day Tokyo). 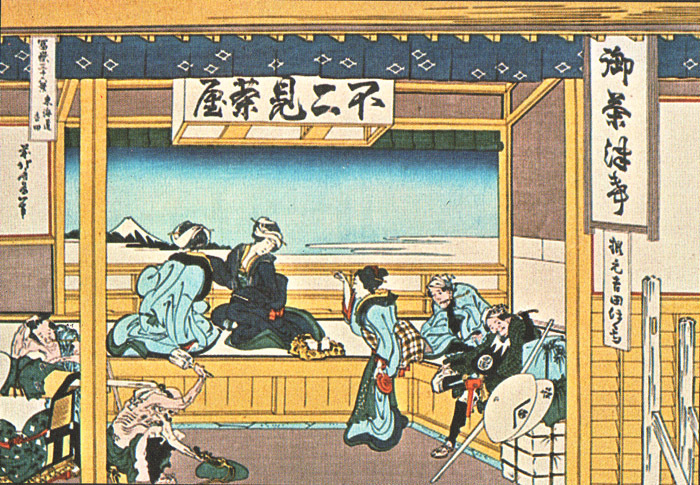 From 1778, when he was eighteen, he had studied figure drawing, color, and design with the master Shunsho and other artists of the ukiyo-e school, those printmakers who depicted the passing scene so deftly for their eager customers: the merchants, the craftsmen, the minor officials, the common people of feudal Japan. 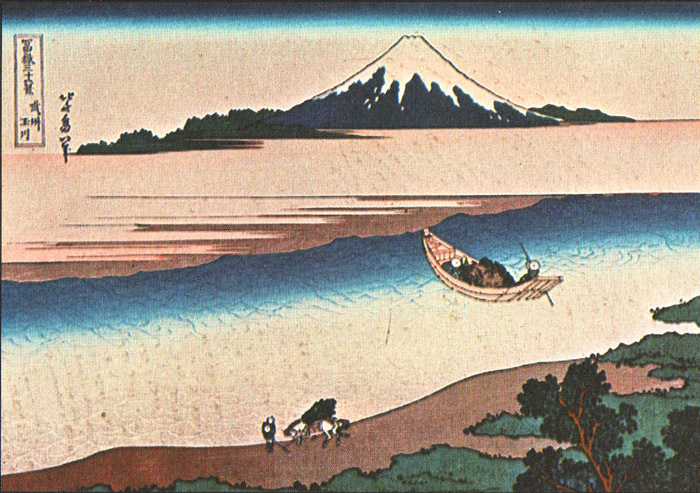 Ever curious, ever seeking, Hokusai had even studied such diverse forms of art as Chinese painting and Western perspective drawing. As his skill grew, he had turned out a prodigious number of woodblock prints, from sketches to greeting cards to book illustrations; from bird and flower impressions to studies of sumo wrestlers, famous actors, and beautiful women. 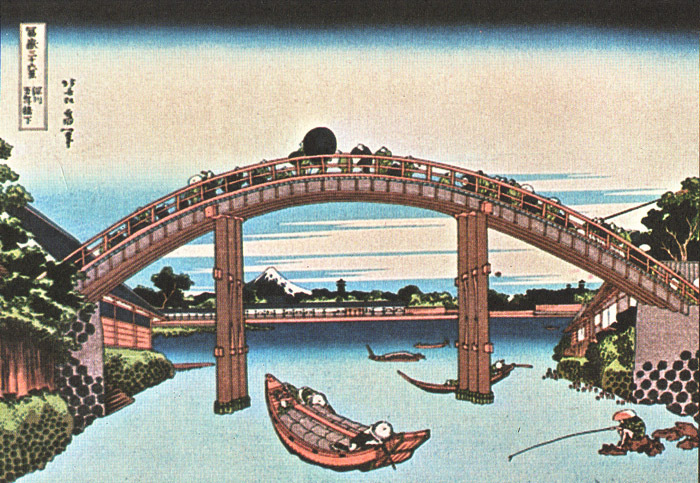 Surely by that climactic year of 1823 he had accomplished all that any ambitious ukiyo-e artist could hope to achieve. All? 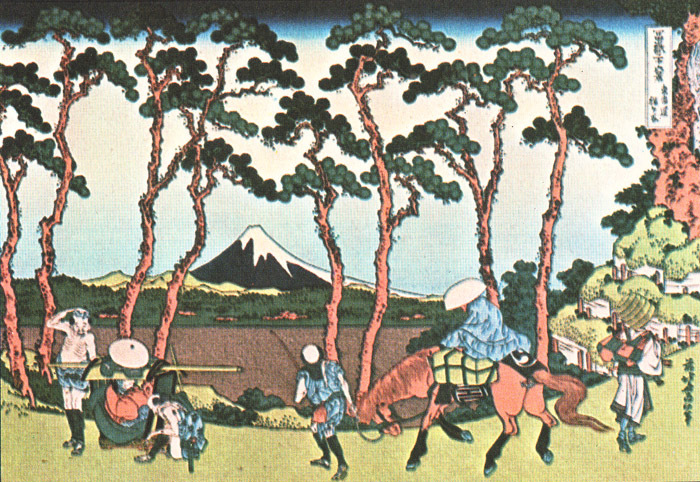 At an age when a man rests on his laurels, Hokusai conceived his first great original project: the set of colored prints called Thirty-six Views oj Mt. Fuji. 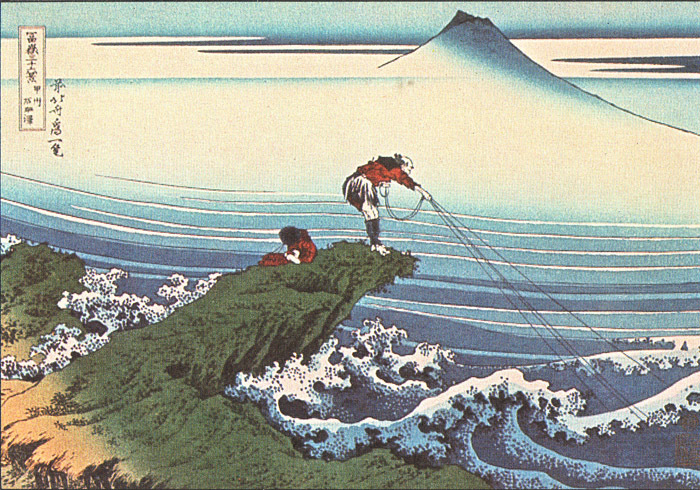 Hokusai's Views of Mt. Fuji are superb landscapes. They are also landscapes with a difference. The people 111 them arc not mere elements of the design but are individuals related to their surroundings and revealed in all the awkwardness, intensity, and vitality of active life. Yet 111 each print they take on a dimension a little larger than life, become part of a single overmastering impression, tantalizing and beautiful. "Straight before me lies the deep valley of the Kanagawa. At the back of the valley, on my right, higher than the white clouds and floating blue-vapors, is Fujiyama. From base to summit his full figure is visible, in outline beautiful like the curve of wings. Not even near his summit can the clouds attain, but hover m the blue valleys at his feet." When he returned to the United States in ro.22 to resume college teaching and to write textbooks in English composition, Easley Jones did not forget about Japan. Musing over Ins souvenir prints, he found that the Views touched chords in his memory, teased Ins poetic imagination. He took up His pen. "That's the mountain, sacred, shimmering, blue . 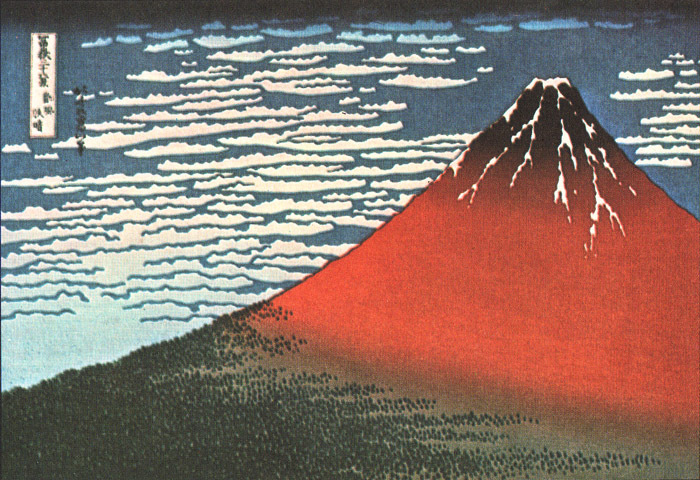 . ." he wrote of Fuji seen through the eyes of a group of Hokusai pilgrims. But no, a loftier theme. It is for those who loiter, brood, and dream. Do people go to the temple any more? Oh yes, to dig clams. . . .
Cradles his motley caravan. . . .
At this point Easley Jones too felt a challenge: could he write a poem to go with every one of the prints? To the delight of his family and friends, he did. 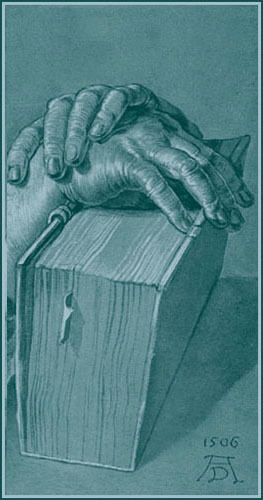 The poems were not published, however, but were put aside while the author continued to cultivate enjoyment or Japanese life and art through collecting old prints and illustrated books. Today for the first time a selection of his poems, together with copies of the prints they celebrate, is offered to a public freshly aware of the beauty he long cherished. The old cask man has not a glance to spare. For wine, or common beer. Place in it what you choose. With high and bright surmise. The dazzle of their eyes? With fears and parasites of their own). Again the living, bright, pure culture stream ? 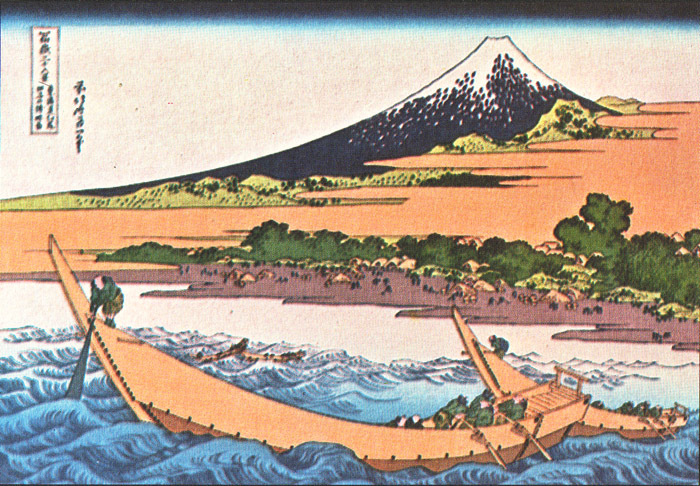 Faint, wavering line 'twixt Fuji and the sea. Why your ghostly passage there ? Faggots for the peasant's fire. Something more than earthly strange? By the river's ebb and change. For the dim volcanic lands. To the clement of air. It would be like the little Tokyo bridge. Stand in the pale sky, frail bow. Some folk imagine a bridge is made to cross. But no. A loftier theme. Of all mountains, barely this one. Beauty in little, sprung from isolation. A single fish when day is done. What fires sleep in your breast? What torments shake your head ? And winter round your brow. We shove off from the listless beach. With nets to sift the swiftest tide. Seining till the catch is done. If we get back all alive.